Saturday, May 28, 2011 from Noon to 5:00pm, MEW will be hosting Sangria Saturday to celebrate the launch of the bottled version of their “Original Infamous” Sangria. They will be offering Spicy Portuguese BBQ Pulled Pork on freshly baked Ciabatta bread for $5. On Sunday, May 29, 2011 between Noon and 5:00pm, MEW will switch from Portuguese cuisine and Sangria to Gourmet Pizza and Baco Noir! Gourmet made to order pizza will be prepared for you with an on site pizza oven. Homemade Italian Gourmet Sausage on freshly baked Focaccia bread will be served as well. Cost is $7 per person. The pizza was selected to pair well with their newly released 2010 Baco Noir. Wine and Sangria are available by the glass on both days and the Sangria is also available by the pitcher. There will be live entertainment by Trish Wales with complimentary wine tastings in their wine boutique. 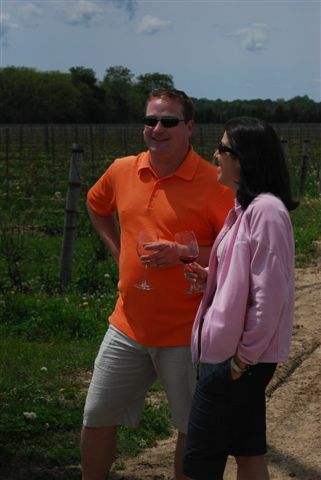 Pelee will be double dipping with events this weekend hosting both the Sip Into Summer and Fine Art Fine Wine from Noon to 5:00pm on both Saturday, May 28, 2011 and Sunday, May 29, 2011. Go celebrate the American long weekend with free tours, live entertainment and a BBQ donated towards charity. Join CREW for Sip into Summer weekend, May 28, 2011, 12:00pm to 5:00pm and May 29, 2011, 1:00pm to 4:00pm, where they will be featuring their Sailor’s Delight Sangria made from their 2007 Red Sky at Night, as well as a Strawberry Ice Margarita made with their 2008 Gewurztraminer Ice Wine! Thai Palace will also be on site serving delicious food to pair with your tastings! On Saturday, May 28, 2011, join Colio for some sizzlin’ wine and food pairings. Sample artisan cheese that will transform your BBQ into a gourmet meal. Who wants to slave over the barby on a hot summer day? What could be easier than adding cheese to some fabulous BBQ recipes? On Sunday, May 29, 2011, join us for some sizzlin’ wine and food pairings. Go home with some great BBQ recipes! Between 12:00pm and 4:00pm on Saturday, May 28, 2001, Sprucewood will be preparing BBQ foods paired with their wines. Then, May 29, 2011 from 1:00pm to 4:00pm, their summer long Sips, Sounds and Bites series begins with each Sunday featuring $2-5 tapas prepared by a local chef on-site and cooking demonstrations that begin at 12:30pm that are followed by live music until 4:00pm.